AskAlan: Does Spieth get a pass for major championship blowups? #AskAlan: Does Jordan Spieth get a pass for his major championship blowups? What. An. Open. I'm typing this on the flight home, still buzzing about Sunday. That might be the most action-packed Sunday at a major since the 2011 Masters. So much to chew on in this week's AskAlan British Open edition… Was Tiger's flop shot on 11 more an indicator of his confidence in his game or realization he has few chances left to win a major and feeling he to go all-in when he has a chance? #AskAlan - David (@dleect) I keep thinking back to that shot. It was such a brutal mistake. Given the downslope on the back side of the bunker behind which the flag was tucked, and the inability to spin the ball out of the thick grass, the best flop of Tiger's life was still going to trickle 12 or 15 feet past the hole. So even with a high-risk shot he was likely to make a 5, which would have kept him tied for the lead. The glaringly obvious play is to knock it 25 feet past the hole and take all the risk out. But by trying pull off a too-perfect shot, Tiger suffered maybe the worst pressure-induced implosion of his career. Poor execution compounded their inexplicable decision. For sure there is urgency to cash in every opportunity now. Who knows how long his fused spine will hold up, or how many times at a major he'll get a very fast setup that allows him to mostly leave his driver — which remains a weakness — in the bag. I've written many times in regards to Tiger that the chips yips never go away but rather live inside you like a sickness, just waiting to bloom again. Tiger's work around the greens this year has been terrific. The fateful shot on 11 wasn't a classic yip but it did look like a decel born of tentativeness. Tiger's brain used to be the most powerful weapon in the sport. Now, we have to wonder just how much emotional scar tissue he's grappling with. Your thoughts on Eddie Pepperell's "hungover" confession? #AskAlan - Peter (@pkeen52) What's not to love? The guy is a breath of fresh air, and has been for a good long while. If I was a college golf coach I'd probably cringe, but Pepperell is one of the game's originals and kudos to him for giving it to us straight. Is Rory being honest with himself? Instead of the "I gave it a good go and ran out of holes" line he was taking Sunday evening, how about "If my wedge play and putting was 5-10% better I would have won by 5 shots?" Is he working on this hard enough I wonder? 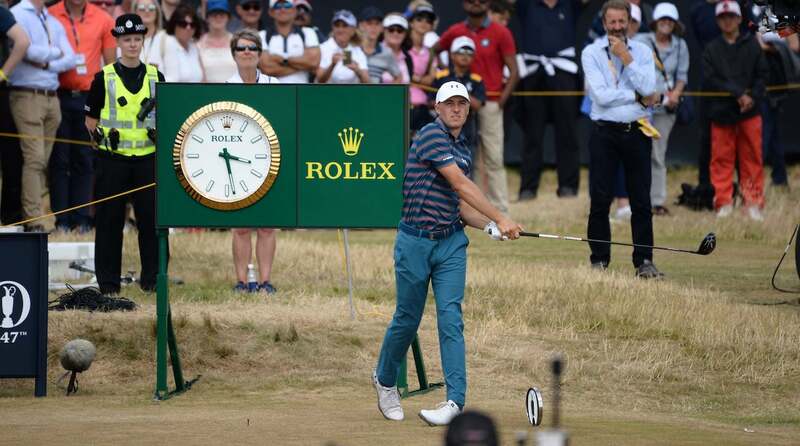 - @MrEdwardLight No doubt McIlroy's weak wedge into 18 when he absolutely had to have a birdie was one of the most disappointing shots of the tournament, right up with there with his blown three-footer on the 12th hole. One thing I loved about peak-Rory was his fire. He was burning to be an all-time great, and he exuded an alpha male energy that other players felt. These days he's much more philosophical and happy-go-lucky. Maybe that was a necessary shift in a long career; that old intensity might have been unsustainable. These days it's trendy to question McIlroy's desire. Only he knows what's in his heart, or if he's still willing to put in the work to maximize his gift and unlock his genius. But he didn't run out of holes – he had just as many as Molinari. The difference is McIlroy make some crucial mistakes under the gun, which has become a disconcerting habit. Do you think Spieth gets a pass for his semi-frequent blow-ups in majors? #AskAlan - Jesse @JShamp I mean, at this point it's part of his brand. Even two of his major championship victories came with near-fatal mistakes: the 71st hole double bogey at Chambers Bay and the drive off the planet on the 13th hole last year at Royal Birkdale.) To Spieth's credit, he's not afraid to acknowledge and even joke about his frailties. But this birdieless 76 at Carnoustie is as damaging to his reputation as the meltdown at the 2016 Masters. For a guy who is a preeminent ballstriker (2nd on Tour in strokes gained tee-to-green last year, 14th so far this year) his swing simply vanishes too often under pressure. And for such a great putter he can be very shaky on Sundays. (As electric as his final round at this year's Masters was, missing that do-or-die putt on the 72nd hole lingers.) Spieth already has a Hall of Fame resume, so he's clearly doing a lot of things right. But he's quickly becoming Mickelsonian, known as much for the tournaments he loses as those he wins. Does Jordan Spieth get a pass for his major championship blowups? #AskAlan Dustin Johnson and Justin Thomas stormed off without speaking to media after they missed the cut at the Open. They are number 1 and 2 in the world and they should answer questions, like Nadal and Federer do, whether they win or lose. Agree? - Yannick (@Ycochenne) I wasn't chasing either of them on Friday so I don't know the particulars of their escape. I will say the R & A cooked up a cumbersome and ineffective arrangement in which reporters were cordoned off from the scoring area so we couldn't grab the players ourselves – we had to request they be brought to a mixed zone and were at the mercy of random staffers to fetch the players. So it's possible they whiffed on Thomas or Johnson or both. But I agree with the thesis of your question. For Tour pros, talking to reporters should be as much a part of the post-round ritual as signing their scorecard. They're in the entertainment business and pro golf events exist for only one reason: to entertain the fans. Reporters are the fans' representatives, deputized to help add context to the competition and bring the competitor to life. Without reporters being allowed to do their job, fan interest plummets, and ultimately this has a chilling effect on the economics of the sport. Tiger gets it, which is why he always talks. For a top player not do so just because they've had a bad round is unprofessional and lame. Given the success of links tournaments, why don't they play the Ryder Cup on more traditional links courses when it is in Europe? - @Spencer_Wideman At the majors we obsess about the venue because it defines the competition. It's the players vs. the course, and every green complex and fairway contour looms large. At the Ryder Cup the playing field doesn't really matter. Sure, you want a good mix of holes and lots of risk-reward, but ultimately the players are battling each other, and the merits of the course recedes into the background. Now, would a Ryder Cup on a great links be more fun to watch? Of course. But these ancient links are all hemmed in by the sea and the towns around them. The Ryder Cup is a huge part of the financial underpinnings of the PGA of America and the European PGA Tour, and they go where the money is, which is to say lesser courses that can offer enough space for the Ryder Cup's massive infrastructure, namely corporate entertaining and packing in more fans than makes sense. So I'm afraid we're stuck with K Clubs and Le Golf Nationals, which are perfectly fine though not exactly thrilling venues. Has Xander Schauffele done enough to get a wild card pick if he doesn't make it on points? # AskAlan - @TonyWurtzSK This is going to be one of Capt. Jim Furyk's toughest decisions. Based on their perch on the points list, their Ryder Cup pedigree and/or simply who they are, there are already nine locks for the U.S. team: Tiger, Phil, DJ, Spieth, Brooks, JT, PReed, Rickie, and Bubba. Webb Simpson is tenaciously holding onto the last automatic spot in the point race, with two defining events coming up: Firestone and the PGA Championship. If Simpson maintains his position that would leave only two captain's picks for a group that includes Schauffele, Kuchar, Kisner, Finau, DeChambeau and Zach Johnson. Given that the U.S. hasn't won in Europe in a quarter-century, you gotta think Furyk will want hardened Ryder Cuppers, which would point to Kuchar and Z. Johnson. If would-be rookies like Schauffele and Finau and DeChambeau want to be on the team they better leapfrog Simpson for that last automatic qualifying spot. My dad thinks Thursday and Friday are better days to go to next year's Open because we'll see everyone and it's more chill. I'm of two minds because Saturday and Sunday are obviously the biguns. Based on your knowledge, what would you say? # AskAlan - @RachelGlass_ It depends on what kind of experience you want. If you want to park it on an interesting hole and see a lot of different players come through, the opening rounds are definitely better, because many big names will undoubtedly miss the cut. And over the opening rounds the crowd is certainly more spread out across the course, making for a more pleasant viewing experience. But obviously the weekend crackles with more tension, and with leaders going off last you can ensure you see the most relevant action. But it's a madhouse following the final groups on Sunday and you have to be really motivated to fight the teeming masses, and even if you do you'll undoubtedly miss most of the best action, unless it's a Phil-Henrik situation and a couple of players have separated themselves. If you can only go for two days, my suggestion is make it Friday and Saturday. That way you get the best of both worlds and then on Sunday you can sit in front of a TV and have a great view as all the drama unfolds. Will you now be giving the R&A some credit for setting the course up the way they did, following your ludicrous tweet 90 minutes into day one when you claimed that over-watering had ruined it? # AskAlan - @RichCousins If you follow me on Twitter you should already know that I tend to traffic in hyperbole on that platform. I still believe the greens were a bit too soft over the opening rounds and it robbed us of some fun and intrigue. But overall the R & A did a fabulous job setting up the course across a very varied weather week. They were certainly correct to err on the side of caution with the greens, and even with Sunday being the hottest and windiest day of the week the course played perfectly. So all credit to the R&A. Why were the course conditions accepted at Carnoustie (fast brown fairways, slow greens) but bashed at Shinnecock Hills (firm green fairways, fast greens)? Both seemed to give non traditional conditions compared with Augusta where the consensus is perfection?# AskAlan - @GoranBarnes The R & A mostly lets Mother Nature dictate the conditions, while the USGA likes to play god and micromanage every inch of the course. Which approach is likely to generate more criticism? The big difference between the setups at this summer's Opens was that the USGA pushed Shinnecock's undulating greens to the very edge, and on Saturday afternoon disaster inevitably ensued. Carnoustie's greens are much flatter and still the R&A still resisted the urge to stress them. It was a wise choice. One lovely benefit could be seen in pace of play. On Saturday at Carnoustie, the final group played in 3:46. That's close to an hour and a half faster than it took the last pairing to navigate Shinny! Eliminating 3-putts and endless grinding on 6-footers is one of the easiest ways to speed up the game. It's interesting that you cite Augusta National. A lot of folks probably agree it's the template for perfection, but not me. It's an artificial reality made possible only with an obscene amount of water, land, fertilizer and manpower. (In our post-Open podcast Bamberger and I discuss this at some length.) Golf is not supposed to be played in a dome. It's an outdoor game, and the vagaries of the playing field is part of the charm. I'd take Carnoustie's quirks over Augusta National's perfection any day of the week. Carnoustie has never failed, in my golf lifetime, to deliver outstanding and memorable Opens. So why the long gaps between its appearance in the rota? Is it already scheduled for a future Open? I read somewhere that the R&A isn't as big a fan of Carnoustie as most of us are. # AskAlan - @Bill_L_Duke There was a lot of chatter last week about Carnoustie's place in the rota. Previous Opens there had underwhelming attendance and I heard from two different members of the British golf firmament that the R & A had told the club it needed to draw 180,000 fans to earn another Open. The announced attendance was 172K, which seems like a push to me, but the tweedy old chaps in the R&A may see it differently. Geography is certainly an issue – it's 2+ hours to drive to Carnoustie from either Glasgow or Edinburgh. The town itself is tiny and has very few hotel beds available, which is not ideal. The R&A has made a 30-year commitment to Royal Portrush; they haven't announced any future dates yet but the new site will almost certainly get at least two more Opens. It looks like these might come at Carnoustie's expense.